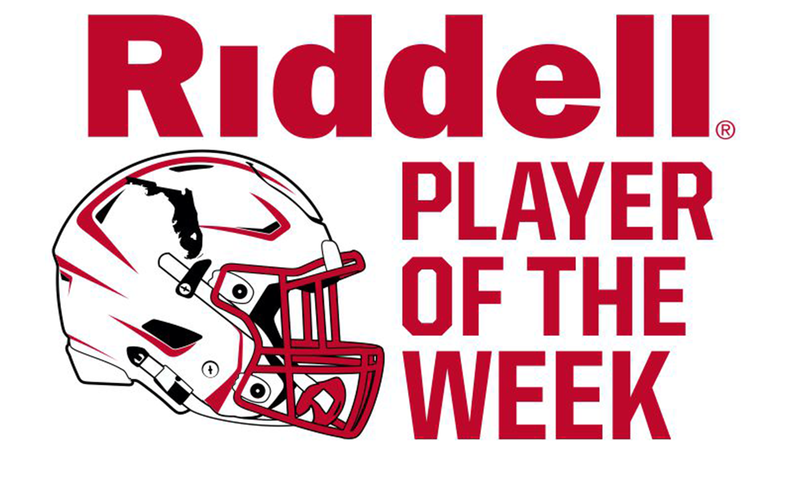 Gainesville, Fla. — Earlier this week we announced our first award winners for Riddell Player of the Week for Week 1 on the FloridaHSFootball.com Radio Show. You can listen to the replay of the announcement above or read more about our Players of the Week here. If you have a player you want to nominate for Player of the Week, check back on FloridaHSFootball.com each Friday night during the regular season to nominate your player for Player of the Week! QB Nick Celidonio, Vero Beach – 27 of 31 passing for 413 yards, passing for three touchdowns and rushing for another one in a 42-20 victory over the defending Class 7A State Champion, Venice. QB Jordan Smith, Columbia (Lake City) – In a game that spanned over a 24-hour period, Smith racked up 388 yards passing, throwing four touchdowns and rushing for one more in a 44-21 win over Gainesville, according to the Gainesville Sun. QB Maurice Underwood, Miami Central – The senior quarterback led the Rockets from a 14-0 deficit to 48-21 win over Cardinal Gibbons (Fort Lauderdale), going 15-27 for 321 yards and three touchdowns, according to the Miami Herald. RB Mike Weston, Nature Coast (Brooksville) – Rushed for 292 yards on 33 carries and scored four touchdowns in a close 30-27 loss to Ridgeview (Orange Park). RB Caziah Holmes, Cocoa – Had 155 yards rushing and two touchdowns in Cocoa’s 35-14 win over Palm Bay, per Alan Zlotorzynski at the Space Coast Daily. RB Corey King, Trinity Catholic (Ocala) – Rushed for 174 yards on 12 carries and scored three touchdowns, plus scored on a scoop and score on defense in the Celtics 42-0 thrashing of Belleview, according to the Ocala Star-Banner. OL/DL Caleb Bulleman, Trinity Christian (Deltona) – Helped paved the way for 282 yards rushing, collected 10 tackles on defense and blocked a punt in a 34-6 victory over Bishop Snyder (Jacksonville), according to the Daytona Beach News-Journal. RB Hunter Kruger, Bozeman (Panama City) – Had 199 yards rushing on eight carries scoring three times from 63, 69 and 59 yards respectively in a 43-7 win over Liberty County, according to the Panama City News Herald.